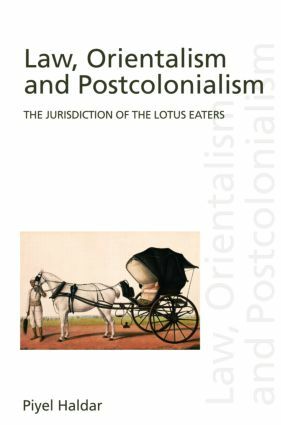 Focusing on the ‘problem’ of pleasure Law, Orientalism and Postcolonialism uncovers the organizing principles by which the legal subject was colonized. That occidental law was complicit in colonial expansion is obvious. What remains to be addressed, however, is the manner in which law and legal discourse sought to colonize individual subjects as subjects of law. It was through the permission of pleasure that modern Western subjects were refined and domesticated. Legally sanctioned outlets for private and social enjoyment instilled and continue to instil within the individual tight self-control over behaviour. There are, however, states of behaviour considered to be repugnant to, and in excess of, modern codes of civility. Drawing on a broad range of literature, (including classical jurisprudence, eighteenth century Orientalist scholarship, early travel literature, and nineteenth century debates surrounding the rule of law), yet concentrating on the experience of British India, the argument here is that such excesses were deemed to be an Oriental phenomenon. Through the encounter with the Orient and with the fantasy of its excess, Piyel Haldar concludes, the relationship between the subject and the law was transformed, and must therefore be re-assessed.